The Irish Catholic Bishops’ Conference will give priority to the faith development of both adults and young people. Catechesis and other forms of faith development will, with the publication of this Directory, have been defined by the Irish Catholic Bishops’ Conference as an area for priority attention over the coming ten years. The Bishops’ Conference will attach primary importance to developing personnel and financial resources for catechetical and other faith development initiatives at national, diocesan and local levels. The position and mission of the Catholic Church in education in Ireland will be confirmed and developed. A review will establish the most appropriate way of dividing responsibilities among various Episcopal Commissions/Councils concerned with faith development, including initiation and catechesis, Catholic education and missionary evangelisation, always acknowledging also those with special needs. The Catholic Bishops will have a policy outlining support for ongoing research initiatives to ascertain and review priorities in catechesis and in all the areas of faith development. The Bishops’ Conference will have a National Faith Development Team which will have responsibility for supporting national co-operation across the various types of faith development for all ages and needs. The executive secretaries to the relevant Episcopal Commissions/Councils together will be established as the National Faith Development Team. One of their number will oversee the Team. Overseeing evangelisation needs nationally across dioceses. Coordinating a sustained dialogue nationwide between faith and culture, providing for a continuing sociocultural analysis, and encouraging an ongoing evangelisation of culture. 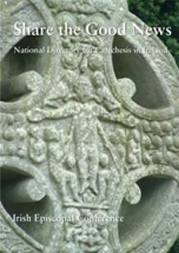 Facilitating familiarity with the needs and requirements set out in this National Directory for Catechesis in Ireland. Initiating and supporting a research strategy to identify national and local faith development needs and suggest appropriate interventions. Supporting dioceses in the formulation of faith development elements of their Diocesan Plan. Helping dioceses establish good practice within their Faith Development Services. Supporting dioceses in the management of their schools through the resourcing of their Education Office. Drawing attention to local adult faith development needs and supporting dioceses in providing for those needs nationwide. Briefing the various national associations of Diocesan Advisers for Religious Education. Maintaining a centre for information on all faith development matters. Initiating new projects nationwide and expanding existing ventures in the various areas of faith development. Providing ongoing access to initiatives and resources through its website. Advising writers working on catechetical and religious education syllabuses and programmes. Producing an annual report, detailing national faith development initiatives. Reviewing the national policy for faith development at regular intervals. The National Faith Development Team will work closely with the Catholic Communications Office and other national offices of the Catholic Church to ensure a common understanding and continuity of approach to faith development throughout the Catholic Church in Ireland. These objectives are taken from Share the Good News: National Directory for Catechesis in Ireland §143-144. 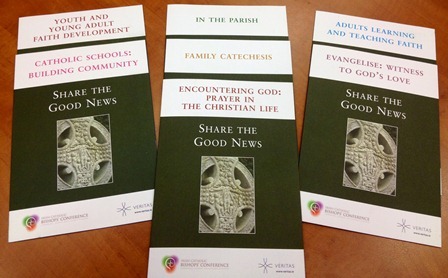 As we celebrate all the many efforts being made in Ireland to share our faith with renewed purpose, the Implementation Committee for Share the Good News: National Directory for Catechesis in Ireland has recently 'sent to press' seven thematic presentations of the Directory to be used across the country. They are intended as aides to reading the Directory itself and are available in the set of seven or individually. Each parish will place the faith development of all its members at the centre of its stated mission and goals, promoting the parish’s Faith Development Plan at every opportunity. The parish will have a graduated Faith Development Plan to be realised step by step over a set period of time. The Parish Priest will ensure that personal and community catechesis is kept to the fore in the parish and in the minds of parishioners. Prayerful reflection on the Gospel will form the basis upon which the parish engages in catechetical and other forms of faith development planning. The Parish Priest will see that a professionally qualified and experienced person is appointed as Faith Development Coordinator for the parish, possibly in conjunction with neighbouring parishes. Suitably trained volunteer parishioners, working as part of various parish teams, chosen according to the particular needs of the parish, will fulfil, as catechists, a mentoring role with adults and young parishioners who are growing in their faith. The Parish Priest will identify faith development goals specific to the particular requirements and resources of parish members. The parish will collaborate with other parishes, the deanery and diocese in initiating and overseeing local catechetical and other faith development projects. The parish will strive to meet the faith development needs of everybody within its remit, particularly those who might not have a strong voice. The priest in the parish will demonstrate a clear commitment to the evangelising and catechetical nature of his ministry, and strive, with the support of parishioners, to give the various levels of faith development due priority. The Parish Priest and those who collaborate with him will demonstrate a commitment to support and encourage one another and those volunteers who have been given particular faith development roles in the parish. The parish will encourage the priest in the particular role he plays in its evangelisation. It will provide practical support, especially in his celebration of the sacraments, his delivery of homilies and his other catechetical inputs in the parish. The priest as presider at the celebration of the liturgy will ensure that catechetical opportunities intrinsic to the liturgy are used appropriately. The parish as a community will seek to nourish and support the priest, personally and spiritually, helping him to grow with them in faith. Adult faith development will be at the centre of parish life, helping the community to grow vigorous in its conversion to Jesus Christ. The Parish Priest and those who assist him will demonstrate a clear commitment to lifelong education in Christian faith, highlighting continuing adult education in the parish’s Faith Development Plan and in their day-to-day work. Where there are adults preparing for initiation into the family of the Church, priority will be given in the parish to the RCIA process. All those who minister in the parish will be educated in the principles underlying, and implications of, the RCIA. The Faith Development Coordinator, involved personally in ongoing faith education, will assume responsibility for overseeing a ministry of adult faith development in the parish. Opportunities for members of the parish to participate in theological reflection will be encouraged. Ongoing conversation will be entered into with local third-level colleges offering theology, philosophy and pastoral ministry modules, with a view to encouraging participation by interested adults from the parish. The parish will strive to proclaim the Gospel to adults who are alienated or who have drifted into religious indifference. At regular intervals, the parish will initiate adult programmes to accommodate specific groups, such as young adults, parents/guardians, those who are single, the elderly and people on the margins of the community, inviting them to partake in an adult conversation about faith in their lives. Marriage education, including preparation for marriage and ongoing marriage enrichment, will be given particular support by the parish community. Regular in-service will be provided for priests, deacons, religious and those who collaborate with the Parish Priest, seeking to support them spiritually, affectively and intellectually in their own faith commitment, and encourage them to develop further their pastoral skills. The catechetical and religious education needs of young people will be given high priority in the life of the parish. The parish will have an established support system for family catechesis, helping parents/guardians, grandparents and young people to speak and pray together in the light of their everyday experience. A Family Mass ministry in the parish will encourage families to participate in parish liturgy and community-building, as well as in reaching out to those in need. The parish, facilitated by the Faith Development Coordinator, will provide parish preparation for the sacraments of initiation, in conjunction with parents and with the local schools. Parish volunteers will receive training to become members of parish Baptismal, Confirmation and First Communion Teams. A designated priest of the parish and the Faith Development Coordinator will visit the parish primary schools, working in co-operation with the school Principal, Religious Education Co-ordinator, and teachers of students preparing for the sacraments. The parish will develop a youth initiative to support, in a variety of ways, the faith development needs of adolescents. Priests and Faith Development Coordinators will be in touch with local post-primary schools. The parish will facilitate the commitment to service in Church award scheme for the senior cycle age-group, mentioned in Chapter 5 above. The parish Faith Development Plan will be inclusive, giving significant attention to those who have specific needs in relation to faith development. Those who are experiencing family, financial or other difficulties will find support in their faith community. There will be easy access to the parish church, parish centre and school buildings, such that those with special physical needs feel welcome. Those with special learning needs will be integrated into the parish, including its liturgical rituals and community events. Migrants and other newcomers, as well as Travellers, when present as part of the local worshipping community, will experience the hospitality of the faith community, and contribute to its growth. Ecumenical, intercultural and inter-religious outreach will be considered an essential part of parish life. Those who are living with illness will receive special attention from the parish. Their contribution to the parish’s sense of care, community and prayer life will be cherished. These objectives are taken from Share the Good News: National Directory for Catechesis in Ireland §131-135.